Can’t find the perfect decorations to fit your colour scheme? Why not make your own paper mache ornaments that have their own individual flair? Making your own Christmas decorations is a great way to create a look that’s totally unique. Paper mache ornaments are a great alternative to glass decorations, especially if you have young children. They won’t break, they don’t harm the environment and making them can keep little fingers busy for hours. Blow up a few balloons to soccer ball size and tie off the tops. 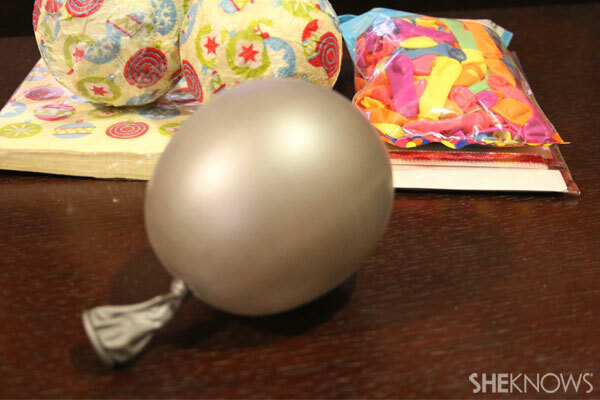 Brush a layer of glue over the entire balloon. Tear up small strips of the paper of your choice and lay them one by one over the balloon, adding more glue where the strips overlap. Repeat this process until the balloon is covered by two to three layers of paper. Brush over the final layer with another coating of glue to seal. Once the paper is dry — when there are no visible dark, wet spots — pop the ballon and fish it out of the paper ornament. Cut a slit in the top if necessary to make room to slip a trinket inside, then glue the ribbon to either side of the hole to create a hook. Paint or decorate as desired with glitter, stickers or other objects. Hang on your tree or from a picture hook to create an attractive and unique display that can be gifted on Christmas Day.